Yesterday I went for a walk around the Karori Wildlife Sanctuary (again), after the physio actually suggested that I should go for more walks again to get a better idea of how much my knee’s been improving. The weird thing has been that it feels as if it’s very suddenly gotten much better. As in, I can suddenly walk down steps without having to swing down the bannisters after the first few. I wasn’t expecting it to go away quite so suddenly, and I’m a little concerned that it might come back again just as suddenly. In any case, it did give me an opportunity to get out and go walking again. The part of the fence in this photo is, I think, about the steepest part of the walk. There’s a steeper section near the sanctuary entrance, but it’s blocked off for safety reasons. I didn’t quite get all the way back around to where I started, because I ran into Craig (a friend from ‘varsity), who was walking a couple of dogs, and we ended up changing plans to walk a lot further around the south coast hilltops. Another up-shot of all of this was that I had another chance to walk in my new tramping boots. I waxed them up this time, and I found a lot of nice mud to walk through. Yay for me. They’re still not quite right, but hopefully they should be okay for the river crossing instruction course I’m planning to go on next weekend. 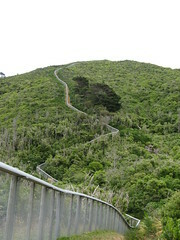 This entry was posted in update and tagged daywalk, injury, karori wildlife sanctuary, shoes, tramping, wellington. Bookmark the permalink.